Aimee Potter, a Northern Kentucky native, received her BS from the University of Kentucky in 2004. She continued her studies at SHI Medical Massage School graduating and receiving her massage license in 2008. Aimee worked for a year with a local chiropractor focusing on deep tissue massage for chronic and acute pain. Seeking a hospital based practice Aimee took a position with the St. Elizabeth Holistic Health Center where she assisted clients with stress relief, chronic pain, recovering from an accident or surgery, finding relief from everyday aches and pains or seeking to maintain a healthy lifestyle. Aimee blends her studies of Swedish massage, deep tissue massage, Reiki, Reflexology and craniosacral therapy to create a unique and healing experience for each one of her clients. 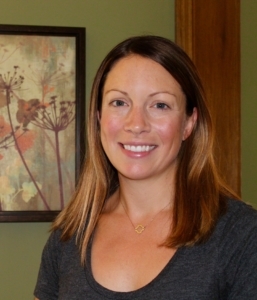 Aimee is licensed in KY and OH and is an Associated Bodywork and Massage Professionals member. She is also a Reiki Master and is certified in prenatal massage, Reflexology and Reiki Drumming. I’ve been seeing Aimee for over a year on a regular basis. I’ve had three back surgeries and have seen more PT, massage and acupuncturists than I care to admit — but it makes me a bit of an expert. She is amazing. She keeps me upright and moving so I can keep up with my two small kids. Aimee is truly good at massage THERAPY. I’m sure she can do relaxation massages, but if you’re like me and searching for someone to dig in and fix something — she’s wonderful.